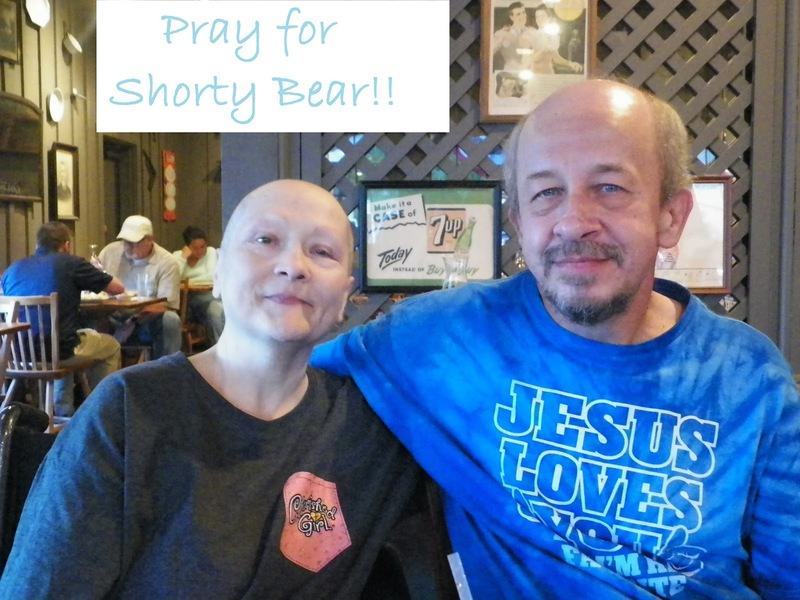 Homespun Devotions: Please Pray for Shorty Bear! Please Pray for Shorty Bear! Dear friends, I am writing today to ask you to earnestly pray for dear Shorty Bear. You will remember me writing this post after meeting with her and her husband last month. Shorty Bear's health problems have escalated since that time, and she is now very ill. Her doctors tell her she is in the last stage of diabetes, and there is nothing else they can do for her. They told her that she has already beat the odds, and that she should make a bucket list and do as many things on the list as possible. Her spirit is so strong, and she continues to press on, regardless. and I am always the one who ends up being encouraged. and to so many of you, too. I asked her permission to post a prayer request for her and only do so with her consent. We all know God has the last word, and He is the Great Physician. and that God will defy the doctors' predictions and grant her more quality time with her beloved, Eddie, and her sweet dog, Coco. I had mentioned in this post that I would soon be publishing her interview here. Sadly, I don't think we will be able to complete the interview, due to her extensive health issues. I acknowledge that God always knows what is best and accept His will. we must always trust His wisdom. Thank you ever so much for reading and for your faithful prayers! and there are so many others who need so much prayer at this time. who desperately needs your prayers for her home situation and marriage. Please pray for her, dear friends. Pray that God will heal what is broken in her life and give her daily wisdom and strength and direction for her future. in the midst of being homeless, due to the recent flooding. for which we are all so thankful, but a permanent home for her and Kevin's uncle is needed. They lost nearly everything dear to them in the flood, including wedding pictures and so many other cherished possessions. There are so many hurting hearts in our broken world. The recent violence just literally boggles my mind. as I cannot stand to absorb one more heartbreak. If only we would all turn our eyes upon Jesus! If only our hurting world would seek His face! yes, at last, we would all be united as one. "When all around my soul gives way, He then is all my hope and stay. We dare not put our hopes and trust in anything or anyone in this life. All here is sinking sand. All here consistently changes and gives way and is so undependable. as God continually leads us to deeper levels of trust. I wrote about it in this post and this post and most recently, here. In Christ alone dare we put our trust, dear friends. Lifted Shorty Bear in prayer just now. I'm praying God will show us a miracle. Amen, and amen, sister! God is able to do exceeding abundantly above all we (or doctors) can ask or think. We must keep praying and believing for Shorty Bear. She would do the same for each one of us. Thank you for your visit and kind words, Deborah. I had been missing here sweet replies and posts... praying now to Jehovah Rapha, the God who heals to touch Shorty bear with His presence, His peace and his all consuming fire of healing to destroy the work on the enemy in her body, to recreate, restore, and reclaim that which has been taken from her, in Jesus precious name, by his stripes, and by the blood of the Lamb, Amen! I miss her so much, too. She could always be counted on for a kind word when we needed it most. Thank you so much for your visit, Schotzy, and may God answer your amazing prayer for Shorty Bear. bless you for your love, and prayers. appreciate you very much, and love you sister. I am praying over all of these needs. I love and appreciate you so much, dear friend! Thank you for praying. Praying much for you! Praying for Shorty Bear and all others who are suffering right now. Thank you for letting us know about this. Thank you, dear Betsy, for your love and prayers. God bless you! My sweet, faithful prayer warrior friend. Thank you for always lifting up those in need of prayer. You are such a great blogger intercessor! I prayed through all the requests you shared. Thank you for sharing the words to that great hymn. I've sung it many times, but the way you framed it, the words meant that much more. Thank you, precious friend, for your kind words and love and friendship...and most of all, your faithful prayers. You are such a gift and blessing to us all! Thank you for this update on all these people we are praying for. Surrounding them all with my love and prayers to overcome all this in the mighty name of Jesus. Love you, warrior friend. So glad you are there to lead us in these requests! Thank you so much, sweet Mary. Love you so dearly. God bless you abundantly! Bless you for this heart warming post on behalf of our Precious Shorty Bear. From the time I started blogging she has blessed my heart and inspired me with her strong faith and joy regardless of what she is going through. She is amazing!! My prayers are with her and your many other concerns, dear Cheryl. She has been such a dear blessing to so many of us, hasn't she? Thank you for your faithful prayers and support, sweet friend. Sending you much love and many blessings, too! I will pray for Shorty.. May God bless her and family and may she feel His presence in her life. Her strong faith will not only comfort her family, but you and her friends. Praying for that miracle. Thank you so much, dear Judy. Your prayers and kind words and loving thoughts are so appreciated! God bless you abundantly! I have prayed for Shorty and all the other requests you shared and will for you and your family, too. Oh, dear friend! I know your heart is heavy over this, and I will surely be praying along with you. I know God will have angels encamped around Michael keeping him safe and bringing him home to you without harm. May He comfort you and bless you and keep your faith strong in Him. Try not to worry...I will carry this burden with you. Let me know when it is over. Many hugs and much love to you! Thank you SO much for your faithful prayers, dear friend. You will never know how much it means to me to know that you are praying. What a blessing you are to all of us here in blogland. May the dear Lord bless and reward you abundantly and keep you always in His care. Sending you much love! Dear sweet Cheryl, please know that I will indeed be praying for "Shorty Bear." She is such a precious blogging friend and I must confess that I was not aware of her condition worsening since I have been rather absent from blogging. THANK YOU for mentioning her. And please know that I shall also be keeping these other prayer requests close to my heart and uplifted to the Lord. Thank you for the sharing the beautiful song at the end...I shared this very song on my blog on Sunday as it's been on my heart for the last week. What HOPE we have in Christ alone. Much, much love to you, my friend. Oh, you are SO right, sweet Stephanie! Our hope is in Christ alone. I dearly love that precious song, too. I am so thankful for your dear comments...it was such a joy to see that you had stopped by. You encourage me so much! And, thank you ever so much for praying for dear Shorty Bear. She is so precious to us all. God bless you, sweet friend...sending you much love and many hugs! Good Morning, sweet Cheryl...and thank you so much for stopping by my blog for a little visit...you are always such an encouragement to everyone. All these precious folks you have listed who need prayers...and countless others...yet our Lord is great enough to comfort them all in the midst of their suffering...and hold them in His most Holy hands. As I am typing on this foggy Maine morning...I am watching a majestic blue heron eating his breakfast of frogs from our little pond in the back yard...and I sit in awe of the amazing splendor of our Lord and his creation. In troubled times such as these, how comforting to know that He is in control and is ever near. My humble prayer this morning is that the Lord will cradle each of these sweet folks you have mentioned...that He will bless them with a peace that passes all understanding. Thank you SO much, dear, sweet Laura, for praying for the dear ones mentioned here. Surely you are a blessing and encouragement to me and to so many others. I still think of you and the great loss you suffered recently. God is our refuge and strength...how blessed we are to have Him and that He intersects our lives the way He does. Sending you much love, my friend. Prayers for your dear friend. Even when we place our trust in God who is sovereign, it doesn't always make it easier to understand. And we must never give up on the power of prayer, and the reality of miracles surrounding us every day. You are so right, Megs. It doesn't make it easier to understand. Thank you for your sweet encouragement and kind words. God bless you abundantly! Praying for Shorty Bear, your friend, Kevin's aunt, and the hearts and souls in this country. May our Father pour out his Spirit on all the hearts and souls and bring us together in love. Thank you, dear brother, for your kind words and your faithful prayers. You are a consistent blessing and encourage to my family and me and so many others, too. God bless you abundantly! Dear Shorty Bear may she enjoy her family and friends as we all should everyday. I am praying for her and may Jesus be extremely close to her now and forever. Thank you for sharing with us here at Tell me a Story. Thank you, dear Hazel, for your prayers and support and kindness. I do trust all is well with you and Robert and your family. Sending you much love and many blessings. Oh, dear Barb!! I am SO sorry to hear of this sad, terrible loss! How awful for you, dear one! Please know that you have my deepest, most sincere sympathy. May God just hold you ever close to His heart and hold you while you grieve and long for your son. Thank you ever so much for your precious prayers for Shorty Bear and the others. Sending you much love and many blessings! Prayed as I read your words Cheryl. Thank you for your diligence in bringing these matters to our attention. And, thank you, dear Wanda, for your faithful prayers. You are such a blessing to me. Sending you love and hugs! Sending prayers for Shorty Bear. Thanks for posting, Cheryl. Thank you so much for your prayers, Bethany! They mean more than I can say. Sending you love and blessings, in return! I'll be praying for Shorty Bear. I was just thinking about her today. Thank you so much, sweet friend. So thankful for your visit and faithfulness and prayers!